Still standing in the middle of the street near persimmons alley facing East now. The right hand side of the picture, the eastern side of Dr. Rubin's house. Persimmons alley and a rather unique looking house which would be Street address 320 on the 1923 Sanborn fire insurance map. On the right 320 W. 4th St., in the center 318 W. 4th St. on the left a small portion of 314 W. 4th St.
That building, 314W. 4th St. over the years has served several purposes. At one time it was an auto parts store, another time it was a roller skating rink. This would be 310 W. 4th St.. It's a little hard to see but it appears that there is a lot between it and 314 W. 4th St.. 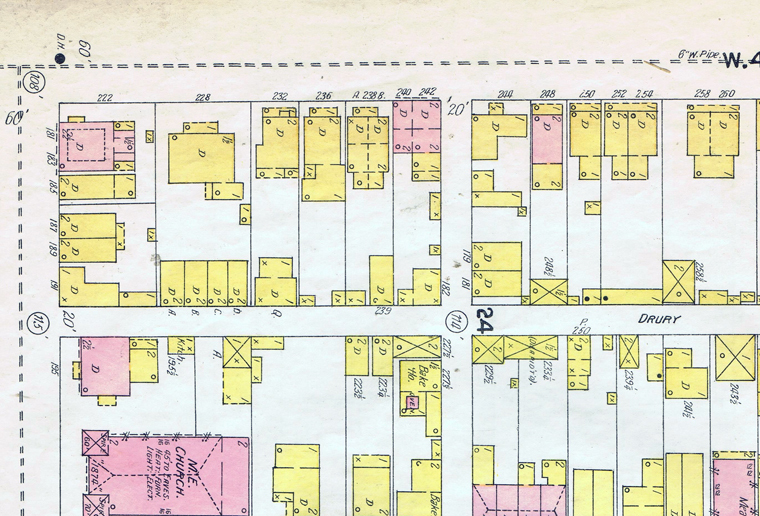 The 1923 Sanborn fire insurance map does in fact show space between those two buildings. To the right portion of 310 W. 4th St. in the center 306 W. 4th St. and on the left portion of 304 And 302 1/2W. 4th St.
On the right is 304 and 302 1/2 West fourth on the left is 300 and 302 W. 4th St. In the center is 300 and 302 W. 4th St.. Turn to the right of that building is Jefferson Street. This finishes are tour of the 300 block of W. 4th St. 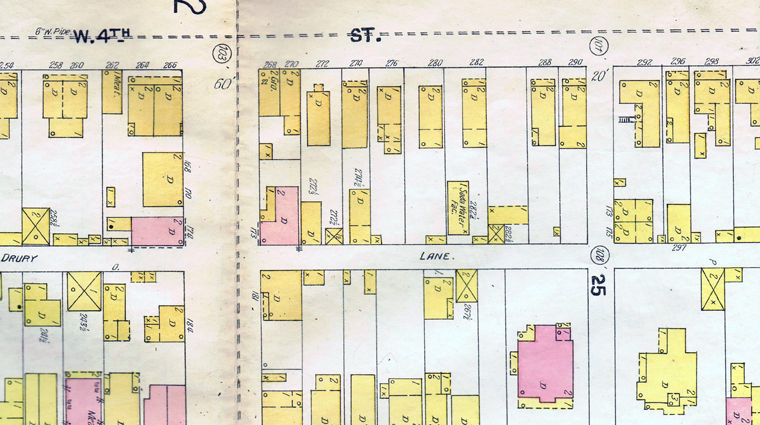 The north side of the street, 1903 Sanborn fire insurance map, 200 block of W. 4th St. The south side of the street, 1903 Sanborn fire insurance map, 200 block of W. 4th St.. Jefferson Street is the street on the right. 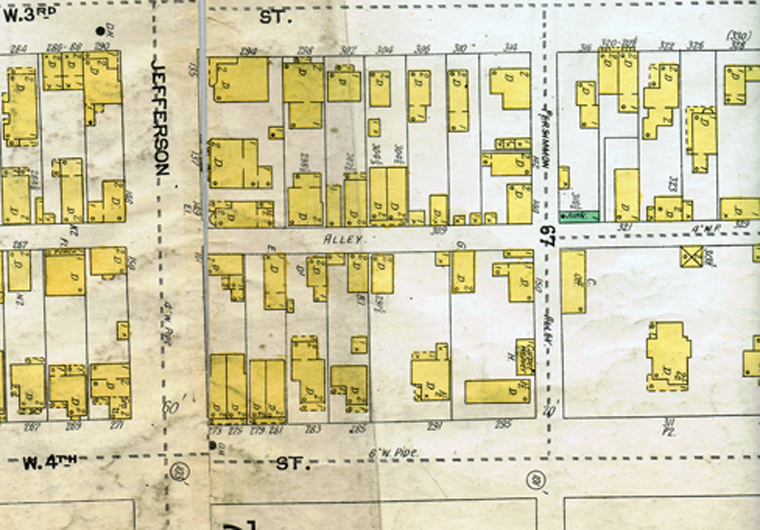 The 1923 Sanborn fire insurance map showing the North Side of the 200 block of W. 4th St. On the far left is Jackson Street and on the far right is Jefferson Street. An Areal view probably taken in the 1950s of the 200 Block of West 4th Street. First house on the north side of the street at 200 block of W. 4th St.. This was correspond to street addresses 247, 245, W. 4th St. on the 1923 Sanborn fire insurance map. Left to right we are seeing street addresses 247, 245, 243. The White House is 229 and the brown brick house is 225 W. 4th St.
East Ally and 223, 221 W. 4th St.